Alright. Now that we’re all on the same page here let’s get down to business. I don’t know if you’ve noticed but Marvel is going buck wild with marketing and tie-ins for James Gunn’s Guardians of the Galaxy Vol. 2. They’re teaming up with Ford for a completely ludicrous Ford Ecosport promotion, there’s an equally out there Geico commercial and assuredly a million more brand synergy opportunities I’m somehow missing but for the best of them all you have to head down to Australia where Marvel has teamed up with Frito-Lay to bring the world something it sorely needs: Guardians of the Galaxy Doritos. 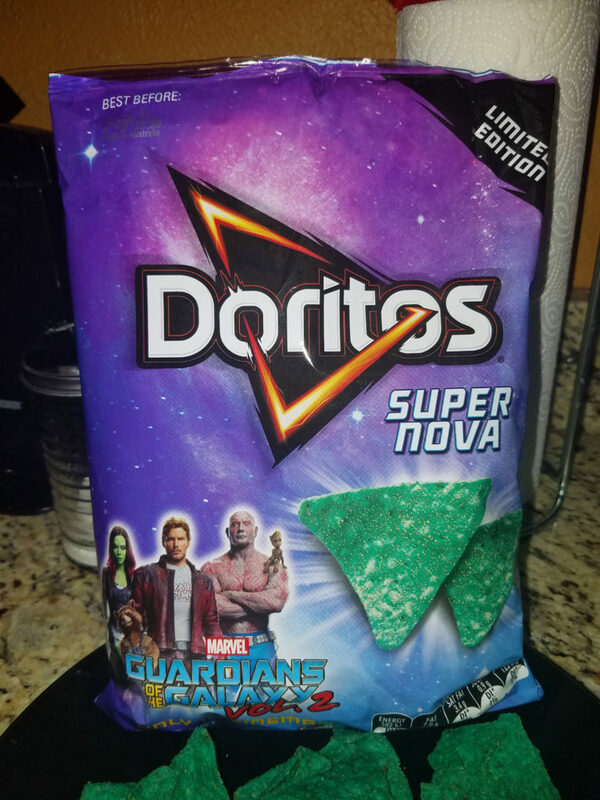 Officially, they’re Super Nova Doritos and that’s a pretty good name for space chips if you ask me. Unfortunately, they’re only available in Australia but Australian novelty tortilla chips are just a quick Google search away provided you can bring yourself to spend about $15 on a bag of chips after shipping. Personally, I’m going to be honest here: I’m experiencing zero buyers remorse. I’ll pay 15 dollars for these bad boys again by the end of the summer, almost assuredly. They’re good. They’re… Out of this world. These chips are beautiful. I’ve never seen a more beautiful chip in person in my life, and Lord knows I’ve seen some chips in my day. The color is kind of difficult to accurately photograph but to my eye they are Aqua or Cyan in coloration. 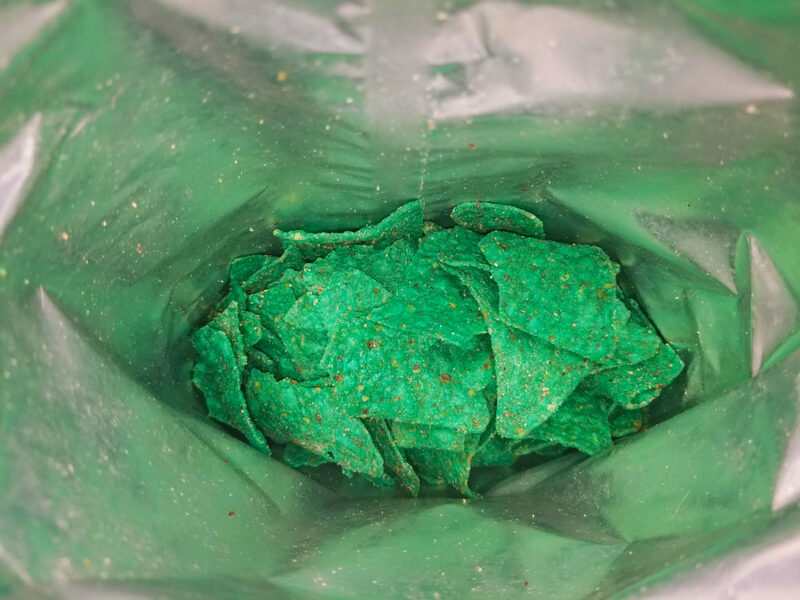 The bag advertises a ZESTY blast of lime dusted ith volcanic BLACK PEPPER (emphasis theirs) and insists that you can take yourself to another galaxy with the STELLAR FLAVOUR & FULL ON CRUNCH OF DORITOS. The bag finishes by inquiring if you snack bold. 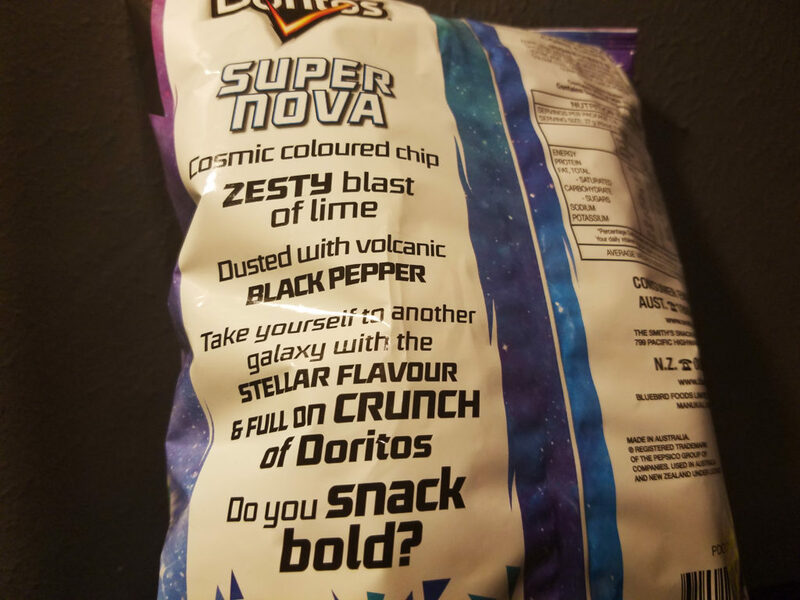 Well, Doritos, I do indeed snack bold. Thankfully so do the Super Nova Doritos. The flavor could best be described as fresh. A bright acidic lime flavor is at the front of the flavor profile with a nice tangy pepper bite afterward. The flavors mingle as you chew and both notes, as contrasted as they are, are strong enough to stay. The flavor combination is a lot mellower and organic than I expected SUPER NOVA Doritos to be. That isn’t to say it’s boring in any way. It’s just fresh and bright. These chips definitely remind me of summer, which is what makes it so strange that these are only available in Australia. After all, Guardians of the Galaxy Vol. 2 is a winter release down there. Regardless of strange region locks being applied to magical blue chips, the fresh flavor is surprisingly natural. As I bought this bag of chips basically sight-unseen, having not coming across any reviews or even firm descriptions of what the product was, it was a pleasant surprise that these are so crisp and bright. Really Blue Chips just kind of screams “unnatural flavor” to me. I’m not sure if Australian Doritos are just generally closer to traditional tortilla chips but these are a fair bit less dusty and processed than the American Doritos flavors I’m used to. I’d argue that’s a good thing and I do realize there is a great deal of irony in describing these amazingly colored chips as less processed. That freshness of the flavor and the lightness of the overall chip means you can almost assuredly eat an entire bag of these in one sitting and not feel like you just doomed your body if one is concerned with that sort of thing (I am not). On the other side of that freshness coin, I could honestly use a little more… Doritle. Is Doritos dust called Doritle like Cheetos dust is called Cheetle? I doubt it, but I want to believe there is consistency between Frito-Lay products. More delicious space dust would be good though, is the point I’m making here. 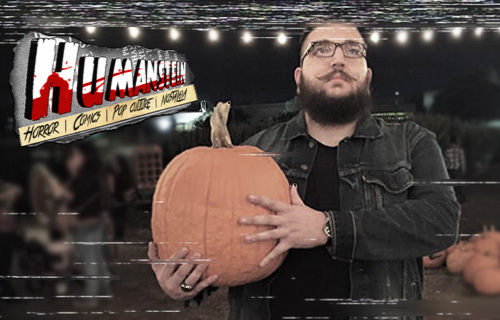 The freshness is a great selling point but I’m a man who knows what I want and what I want is just a little bit more of that bright, tangy flavor and the path to that particular desire is more dust. 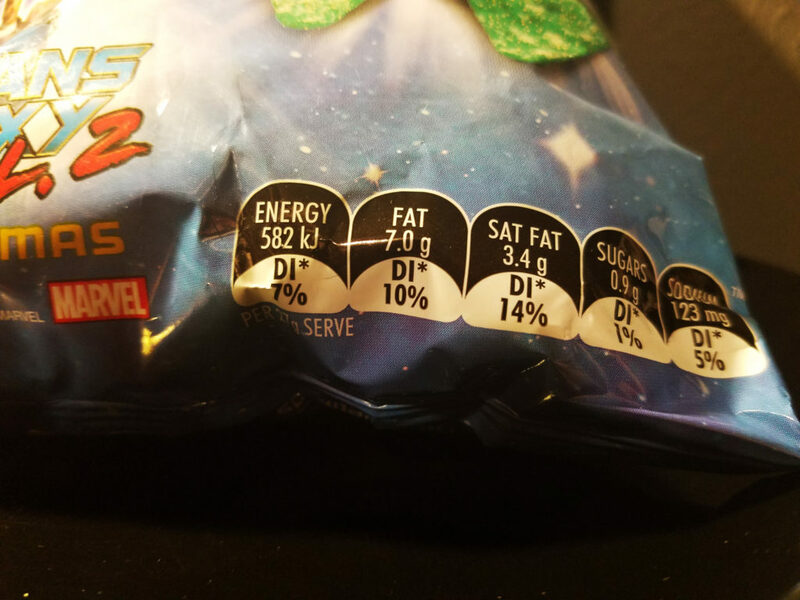 I’m not sure if Bluebird Food Limited, Frito-Lay’s manufacturer or distributor or whatever in Auckland, Australia is listening, but if they are they should know that Super Nova Doritos require exactly 15% more Doritle to be perfect. Energy is a very cute way to say calories. I feel better about “energy”. In summation, these chips are pretty great. 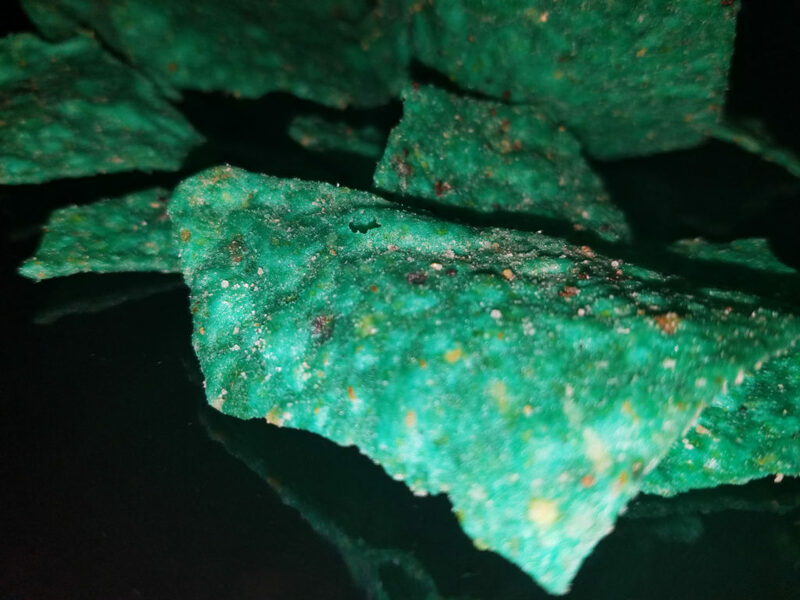 The bright, fresh, tangy flavor is unmatched by any American Doritos I’ve had the pleasure of trying and the fact that they’re so dang blue is reason enough to buy them in my honest opinion. I know blue corn tortilla chips exist but brother, they are not blue enough for me anymore. This is the real deal. If you can get your hands on them, I highly recommend doing so.